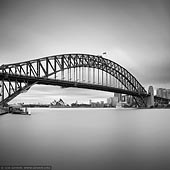 The Sydney Harbour Bridge is a steel through arch bridge across Sydney Harbour that carries rail, vehicular and pedestrian traffic between the Sydney central business district (CBD) and the North Shore. 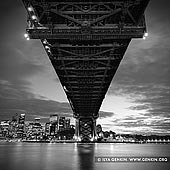 The dramatic view of the bridge, the harbour, and the nearby Sydney Opera House is an iconic image of both Sydney and Australia. The bridge is locally nicknamed "The Coat Hanger" because of its arch-based design. The bridge was designed by John Bradfield and built by Dorman Long and Co Ltd, Middlesbrough Teesside and Cleveland Bridge, Darlington, County Durham and opened in 1932. Until 1967 it was the city's tallest structure. According to Guinness World Records, it is the world's widest long-span bridge and it is the tallest steel arch bridge, measuring 134 metres (440 ft) from top to water level. 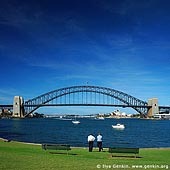 It is also the fifth-longest spanning-arch bridge in the world. 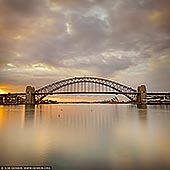 The southern (CBD) bridge end is located at Millers Point in The Rocks area, and the northern end at Milsons Point in the lower North Shore area. It carries six lanes of road traffic on its main roadway, two lanes of road traffic (formerly two tram tracks) and a footpath on its eastern side, and two railway tracks and a bicycle path along its western side, being 305 mm (12 in) broader than the east side. The main roadway across the bridge is known as Bradfield Highway, Sydney, and is about 2.4 kilometres (1.5 mi) long, making it one of the shortest highways in Australia. 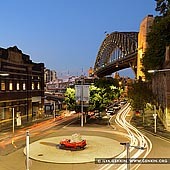 (The shortest, also called the Bradfield Highway, is found on the Story Bridge in Brisbane). The Sydney Harbour Bridge is not completely stationary. It can rise or fall up to 18 cm (7.1 in) depending on whether it is hot or cold because the steel expands or contracts.